They are on a break. They were just a week or so ago talking about ‘ever after’ and things got messy this past week. Kylie wants time to just be by her self and do her. Tyga is not giving up as that’s his one and only lady. Jenner admits using temporary lip fillers. 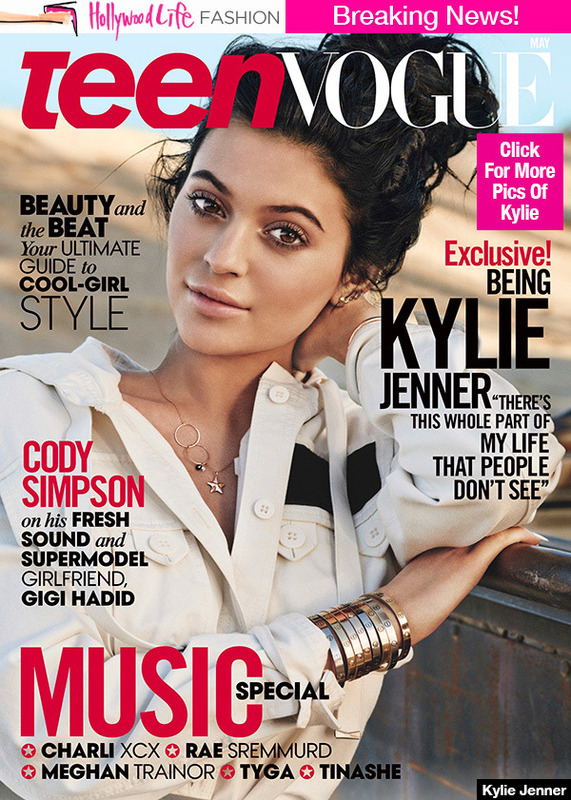 Jenner appears on the cover of May 2015 issue of Teen Vogue. She talks about what it’s like growing up in the spotlight. I feel like I’ve heard the worst anyone can say about me over and over every day. So it’s like my self-esteem definitely wasn’t good at a point, I guess?… But especially having the most beautiful sisters in the world…I just try to find what makes me feel good and be as confident as possible. You know she completely has her own style. Kylie has her own vision on how she wants her home to look. She has a few months now until she moves in, to really take her time and get it together…so she will really embrace that time…and get really creative. Kylie is really excited! Thank you God for watching over us and keeping us safe. 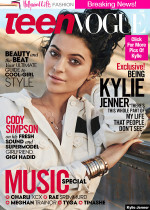 Jenner dons a blonde wig for a photo shoot appearing in the Spring/Summer isssue of Love magazine. Jenner discusses her penchant for colored tresses with Love senior editor, Jack Sunnucks. To be honest, in the beginning [the family] didn’t like it, they thought it was, like, crazy when I dyed my hair blue. When I cut off my hair. And then when I dyed my hair black or whatever, they came to me and were like, ‘We miss the blue hair, this is crazy,’ and I was like, ‘I miss it too!’. 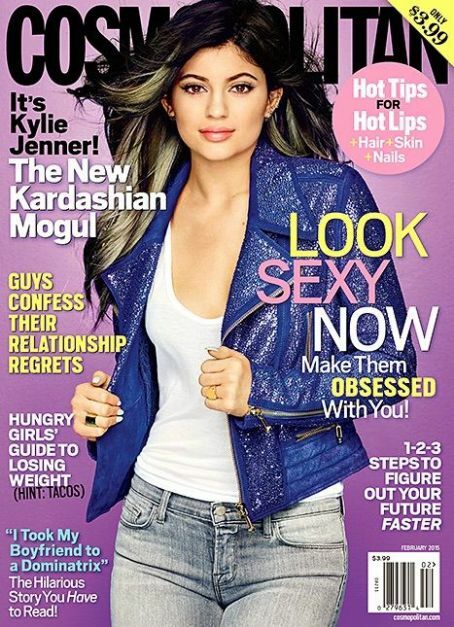 Jenner appears on the cover of the February 2015 issue of Cosmopolitan magazine. She talks about her parents’ divorce, plastic surgery rumours, and growing up in the public eye. When I was like 10, 11, 12, I had a really hard time with the media. During your adolescence, girls deal with their peers at school, then they go home and they don’t have to deal with it [there]. It was a lot more haters to deal with…especially since I was younger and my sisters were so beautiful and had it all together. I can have my moments and say that I don’t want this life anymore, but I wouldn’t trade it for the world. The good is definitely worth the bad. Jenner is featured in V magazine. She talks about growing up in front of the cameras, her sci-fi book, and her socia media. Originally we were going to do a book revolving around me and Kendall, maybe high school girls or something like that. Then we decided we wanted to do something that no one expected, like a sci-fi novel. So it actually has nothing to do with our life, and that’s what we wanted. Kendall and Kylie Jenner are featured in DuJour magazine. They talk about their life and Kendall talks about Kylie being messy. She’s really dirty. She’s the messiest person ever and does not care. Literally she’ll sleep at my house for one night and I’ll go into the guestroom and it’ll be trashed. Jenner is nominated by Shamari Maurice to participate in the Ice Bucket Challenge. She completes the challenge and nominates Jordan Woods, Kendall Jenner and Khloe Kardashian. Seacrest interviews Kendal and Kylie Jenner during On Air With Ryan Seacrest and questions them about their book. It’s a sci-fi dystopian. It’s based in the future, and it’s about the world after this huge catastrophe that drove everyone to live underground. It’s a book about two sisters and how they take on this world and their adventure and their story. Seacrest interviews Jenner during On Air With Ryan Seacrest about Kim Kardashian and Kanye West engagement. No one knew (it was happening). We were on the plane, my sisters and all our friends, on the way there to surprise Kim and we just thought it was a party for her birthday and Khloe’s best friend Malika was like, “I have a feeling he’s going to propose I have a feeling,” and we were like, “No, no.” Mom knew, but no one else. Kendall and Kylie Jenner appear on the cover of the September 2012 issue of Seventeen magazine. They talk about how they went to being friends, a possible spin-off show, and dating rumors. Cody [Simpson] and I [Kylie] are just good friends. That’s it. But we can say that as much as we want and people will still listen to gossip. They call me Cheer Mom, because when we make those big banners for football games, I’m the one to say, ‘Do this, do that; use this color, use that color.’ Not, like, in a mean way. But I just like things in order. I’m a perfectionist.